It’s been hotter than hell here recently, so I figured why not get the ice cream cones up while I’m still dreaming of eating them! 😀 They don’t stand up on their own, they’re a little top-heavy… But they’re perfect for clutching in a tiny little fist! I used worsted weight tan, medium brown, cream, white, and pink. G-sized crochet hook. It’s not the size that’s important so I’m not including a gauge. I crochet pretty tightly, if your stitches are looser you may want to use a smaller hook. The important thing is to make sure that the stitches are tight enough to hold in the stuffing. I used polyfiber stuffing, but any stuffing will do. Scissors to cut the yarn. A needle with an eye big enough for yarn. Part of this is worked in continuous rounds. Use a stitch marker to keep your place and move it up as you complete rows. I use a safety pin and just put it through the last stitch of a round. Sew ice cream to ice cream cone, sewing the top edge of the ice cream cone between rows 11 and 12 of the ice cream. 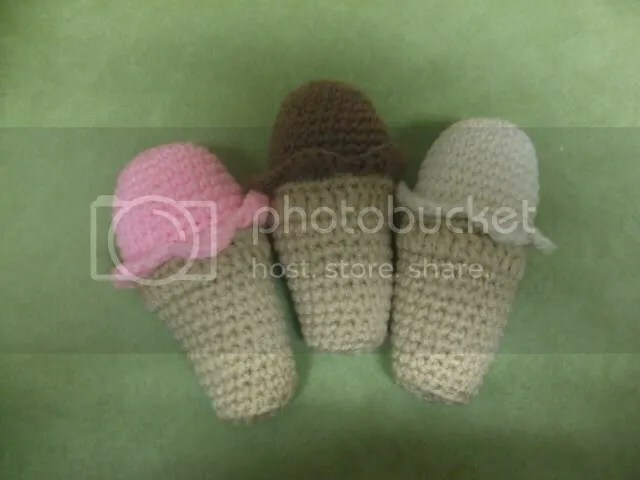 This entry was posted in Food, Free Crochet Pattern. Bookmark the permalink.